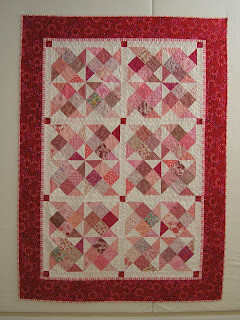 In this post I showed you a few of the of quilt backings which I have pieced from scraps. I've already shown most of the coordinating fronts, but I have this pink quilt left to tell you about. I started making it for my friend Tina who I see every other Thursday. In order to be able to finish this quilt quickly after working on the top at Retreat, I made up the backing ahead of time. 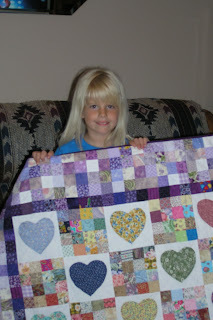 In this post I had all the pieces cut out and a few blocks made. I got the entire top assembled at Retreat and set about getting the quilting done on it last week when I was home. 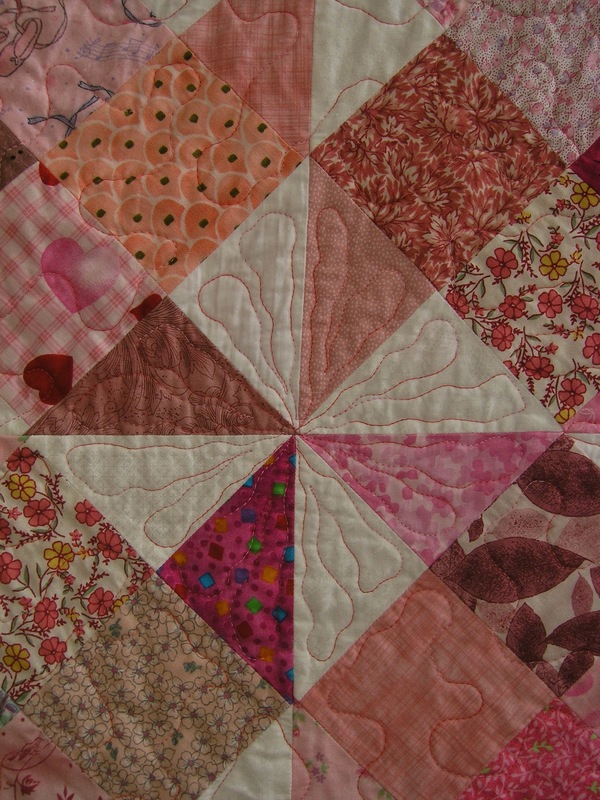 A secondary pinwheel pattern showed up after putting four blocks together and sashing them, so I did a little fun quilting within the pinwheels. Then I did an all-over meander in the blocks, put some loops in the sashing, and stippled in the border. 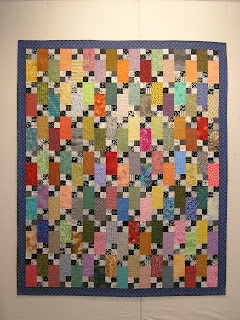 The main block in this quilt is called "Shooting Squares" and is from Marcia Hohn's site, Quilter's Cache. If you have never checked out her site, I highly recommend it. I can always find something I like there. I can hardly wait to present this one, which I have very cleverly entitled, "Thursdays." What can I say? I am better at creating quilts than I am at naming them. 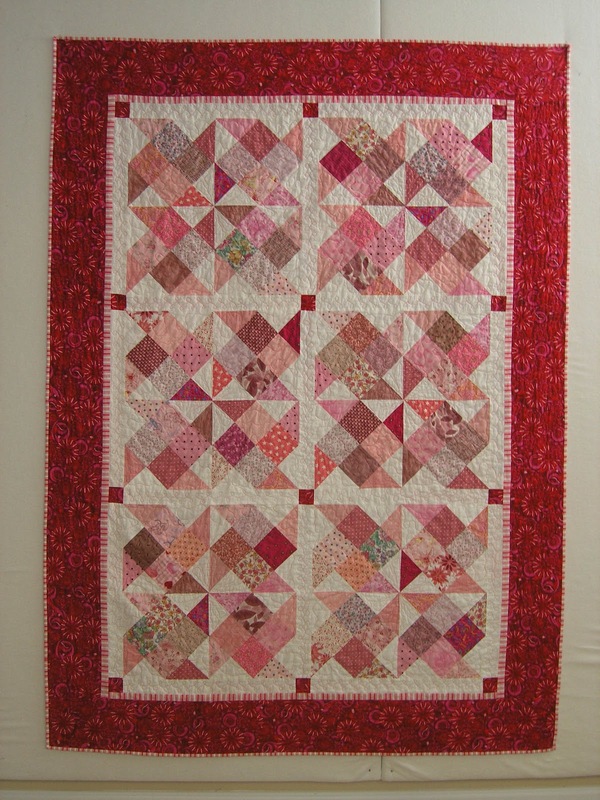 It is better than "Pink Quilt" though, isn't it? I need to finish showing you (ahem....that especially includes you, Mimi) the quilt fronts that go with the backings I posted about here. After all, I need to move on to something more current. Oh, wait! These two quilt fronts are current. 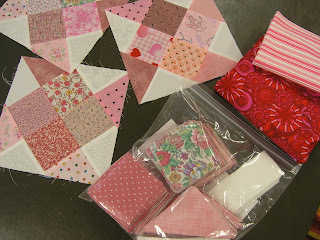 About a year ago I was in a scrap cutting mood, cutting out all kinds of pieces for possible future quilts. I bagged up a project called Bricks and Stepping Stones, a free project featured on www.quiltville.com. 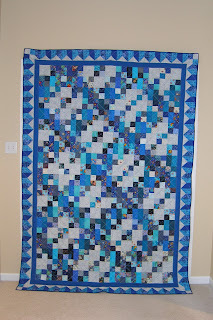 My friend Jan was headed to Florida for two months last winter, afraid she would not have enough to keep her busy, so I sent this project with her. I tried to get her to take more of my unfinished projects, but she wasn't really that worried about having things to do! 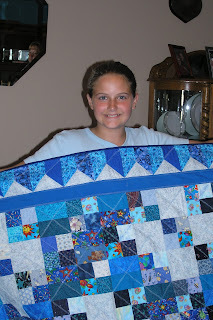 She put the top together for me, and last week I used the blue scrappy backing and got the job done -- quilted and bound! That leaves the pink scrappy backing. 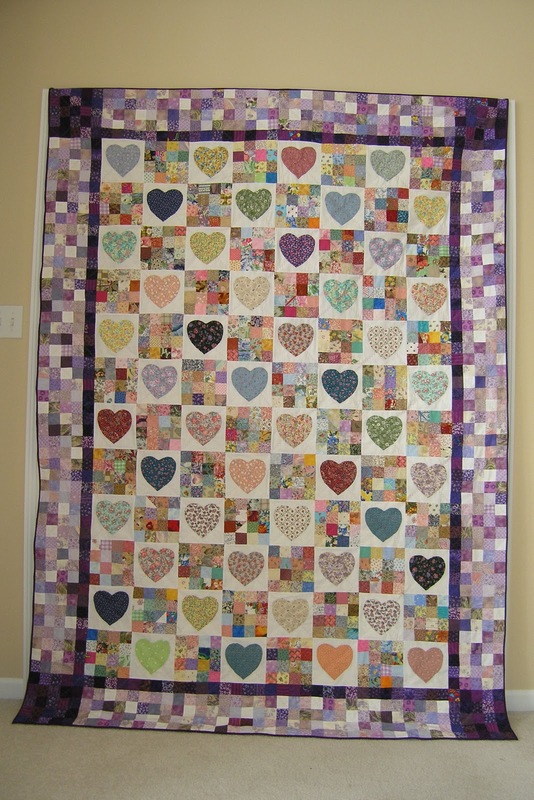 The front of that quilt is all cut out and ready to be put together (yes, by me!) at Retreat this week. And if Jan says anything about not having enough to do this week, she may find all this piled up next to her machine. I have three or four other projects I'm taking with me to work on! 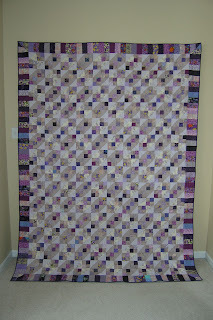 Since Mimi accused me of teasing by only showing the backs of quilts last time, this is just for her. 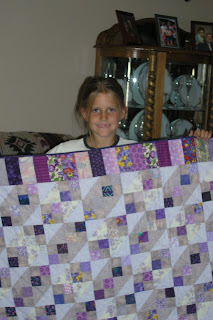 Quilt Fronts!!! Actually, I was going to show them to you eventually, I just didn't want to share everything in one long blog. You might have become distracted and not seen it through to the end, and that would have been awful. The blue backing I showed you was for the back of my niece Natalie's quilt. 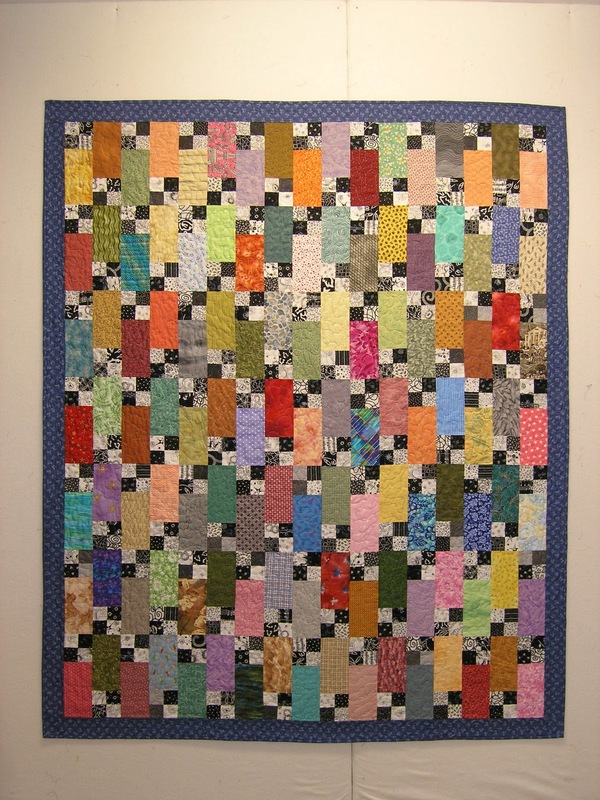 Her quilt is a scrappy version of "Four Patch Plaid" from the book "Nickel Quilts" by Pat Speth and Charlene Thode. The first purple backing shown in the post is the backing for my niece Carrie's quilt. 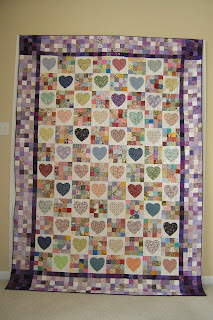 Her quilt is just something I made up on my own by alternating scrappy 16-patch blocks and white blocks with appliqued hearts. A perfect little girl quilt. I had made each of the girls a baby quilt when they were born and a doll quilt when they were little. 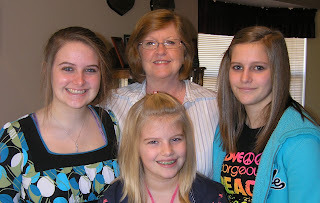 When I found out that they loved their quilts so much that they were still sleeping with them, I knew that new quilts must be made, and quickly! I made all three of these quilts in about two months. But love them, they did! Since I made these quilts for the girls in 2005 here is a more recent photo of them with me, getting ready to leave for one of our fun "Niece Outings." One more from the last blog. 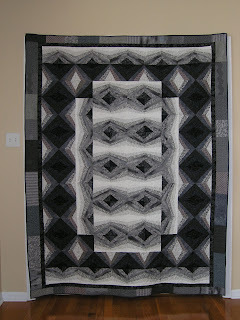 The backing I made from grays and blacks was for a charity quilt I made for teenagers in foster care. 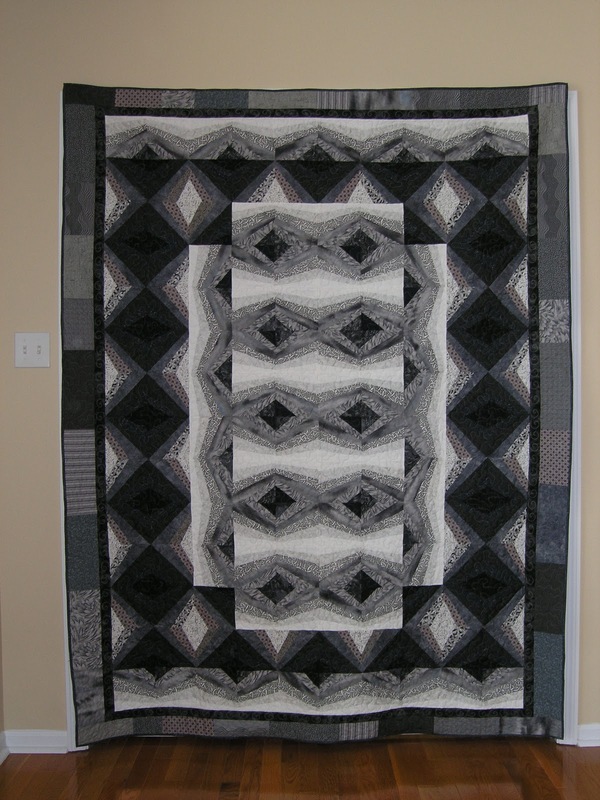 The pattern is from the book "Easy Pieces" by Margaret J. Miller. 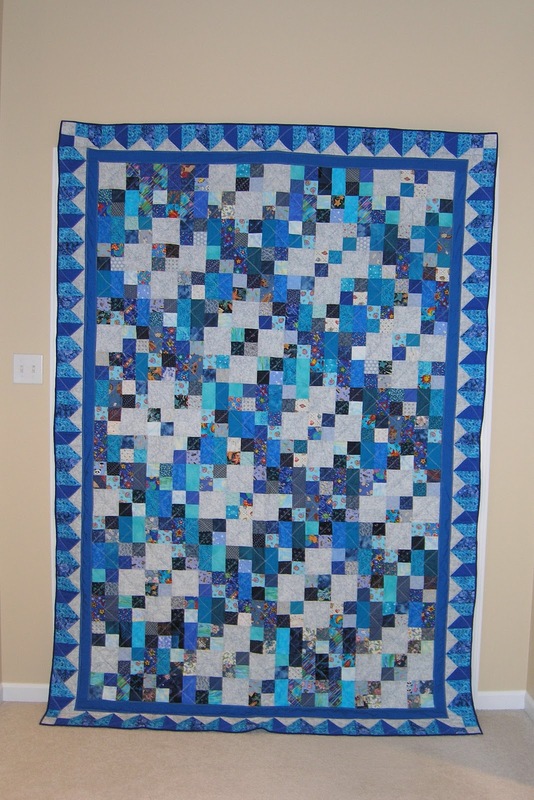 I could just see some teenage boy, between foster families, loving this quilt of his own.